I am currently working on a new card to be added to the ever growing stationary collection. This image may look familiar to you by now as it is based on the coloring page I designed for the ColorATL Coloring Bk. This is a flat one- sided 5×7 card with envelope that will soon show up for purchase in my online gallery. I am attempting to expand the variety of art note cards I offer, so be on the look out for more in the not so distant future. I am enjoying the process of finding what original paintings might work well in a smaller version such as stationary. Please feel free to make requests. It is a long process in which I have my hands in from beginning to end: original art creation, note card design, photograph taking, proof making, print ordering, packaging and shipping. Now, if that isn’t a labor of love, I don’t know what is! And, I certainly owe my gratitude and a size-able commission to my husband – my one and only co-laborer. This is the small business, grass roots, family level of being an artist. I wouldn’t trade it. 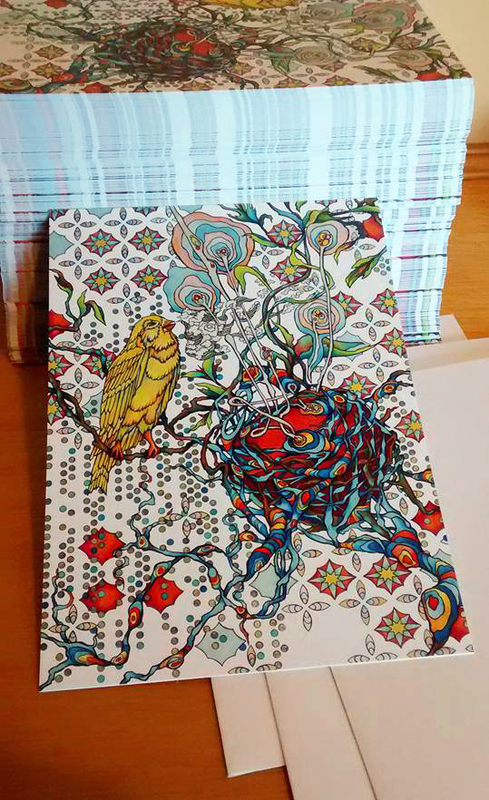 I truly feel the art of letter writing on quality stationary should continue on; and, if enhanced with unique visual appeal, I believe it certainly will. So, brush up on your John Hancock and make a list of people who need to hear from you in such a thoughtful way.